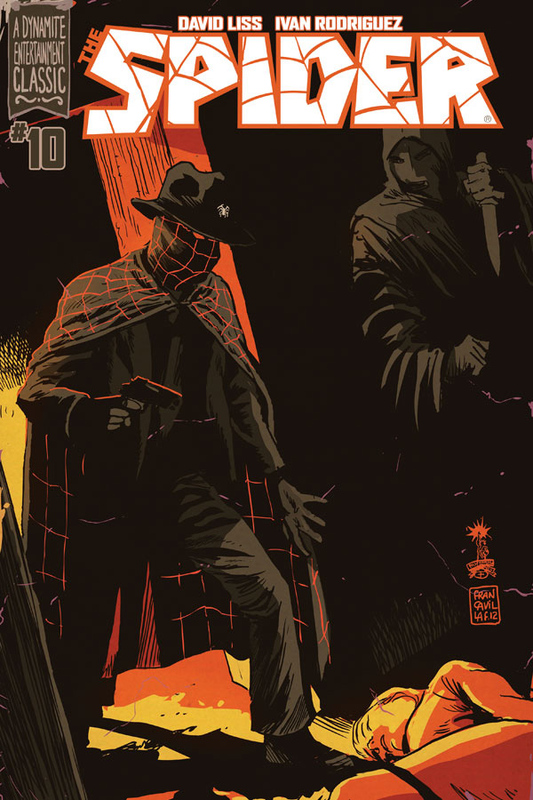 The Fellowship was fortunate enough to obtain a copy of THE SPIDER #10 from Dynamite Entertainment. The story is written by David Liss with art by Ivan Rodriguez, inks by Antonio Lima, colors by Vinicius Andrade and Rael Sidharta, and lettering by Simon Bowland. The Spider was created by Harry Steeger. The Spider receives a tip about a new gang setting up shop and he investigates. It turns out to be a trap laid by a new villain calling himself The Fly. The villain holds at least a dozen people hostage and threatens to kill them if the Spider doesn‘t show up in time. The Spider arrives in time and meets this new adversary, but what are his intentions? Has The Spider met his match? Really cool story here and (I may be wrong here) a great idea of introducing a new arch villain for The Spider and having the identity of The Fly. The art is nicely done here and Rodriguez and Lima handle the action sequences real well. The use of color by Andrade and Sidharta is top notch as well. If you are a fan of a certain hero from the “Distinguished Competition,” I really suggest you check this book out as The Spider was a precursor to that masked man from Gotham City. THE SPIDER #10 is in stores now or available at www.dynamite.com.